I have been using the MAC Studio Fix Powder Foundation for such a long time and I thought that it was about time that I let you guys what I think about them. I had never really intended on trying this powder out, it wasn’t a product that I had lusted after and put onto my wish list. I bought this after going into my local MAC store to pick up a new Studio Fix Fluid that I was running low on and a very lovely sales assistant said that I would love this powder paired with my foundation and that was all the persuading that I needed at the time and before I knew it I was checking out with the MAC Studio Fix Powder Foundation. I have obviously tried other products from MAC over the years and so far, everything has been of a very high quality, so I had very high hopes for this foundation powder. I looked into this a little online before I started using it and all of the reviews were very glowing and everybody seemed to love it and I couldn’t wait to start using it. Then, literally on the morning that I was going to use this for the first time, I dropped it from my sink onto my bathroom floor and not only did the packaging fall apart, the product shattered all over the floor. Not my finest hour, because it took me ages to clean up, but I had to shoot straight back out and buy another. The first thing that I want to talk about with this powder foundation is the packaging. Now, I know that the packaging failed me the first time that I used this, but that was my fault completely. As a whole, I really like the packaging that comes with this product. I love that it is a small compact that is small enough to fit in my handbag. I also really like that there is a mirror in the lid because that means that I don’t have to carry anything that is separate. I also really like that if you lift the tray of powder, there is a small sponge, which is great for on the go and when I am carrying a small handbag or a clutch. This is a full coverage powder and that is one of the reasons why I have been loving it so much. I didn’t entirely think that I would need this powder for the additional coverage because I was quite happy with how full coverage my foundation already is but pairing the two together looks incredible. Because this powder is full coverage, it allows me to go in a touch lighter with my foundation, which feels much nicer on the skin, then when I can pack on some powder just in the areas where I feel like I need it. As a side note I just want to mention that with this powder I have never noticed that my skin looks heavily or overly powdered, even when I do pack it on. When I apply this MAC Studio Fix Powder Foundation on the top of my foundation and concealer to lock everything into place first thing in the morning, it does a good job at mattifying my face. I have a very oily complexion especially now the weather is picking up a little and it is getting warmer, and throughout the day, I do notice that my oils start to come through. They do only come through in the areas around my nose and t-zone that are particularly oily, but it is nothing too dramatic. All I do is go in with a touch of this powder on the sponge that comes with it or with my Real Techniques Setting Brush that is almost always in my handbag and I am good to go. 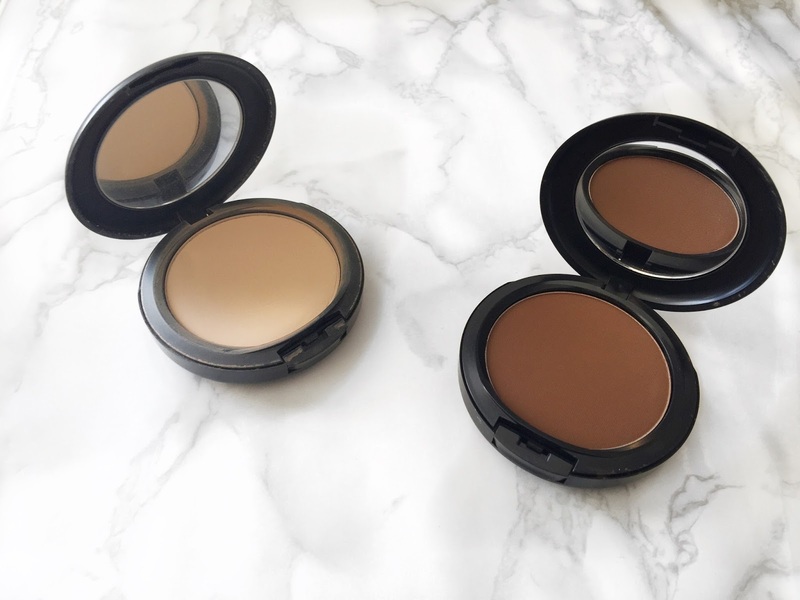 Since trying and falling in love with this MAC Studio Fix Powder Foundation I have even gone out and bought it in a deeper shade to powder contour with and I have to admit that it is my absolute favourite powder contouring product. What I love about this powder to contour with is that the shade is lovely and rich, it applies incredibly smoothly and because it has pigmentation to it, you don’t have to worry about your products moving about underneath the powder. I really couldn’t recommend this powder enough. I have been using it for such a long time and I know that I am going to continue using it. I will leave a link to it down below in case you want to check it out for yourself. Make sure to leave me a comment and let me know if you have tried this powder and what you thought about it! I was matched to a NC35 studio fix fluid, and I feel like throughout the day it definitely oxidises and starts look orange or yellow, do you have this problem with mac liquid foundations? I wear the NC35 powder over a lighter foundation now, I agree it's very matte but does look cakey sometimes, especially if you reapply it on a night out. It is impressive how much coverage you get you can definitely see from your before and after! I haven't really experienced the powder oxidizing but I do tend to have a problem with the Studio Fix Fluid. I leave the house in a morning and it looks perfect, then I get in at night and it is a completely different colour!